Babies get stressed too you know. They deserve a spa every once in a while so they can relax and be calm. Yes, there is a baby spa. Baby spa is a thing now and just so you know, many parents are going crazy about it. It may not be available here in Singapore yet but the idea (of creating a baby spa) will surely cross the minds of entrepreneurs. Who can join? Babies from two weeks old to eight months old can join the baby spa. What to expect? 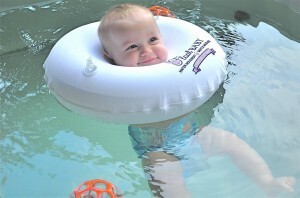 For 20 minutes, babies will float in a tiny pool. With this, babies will be provided with a doughnut-shaped floating device and waterproof diapers. The floating device will be put around the necks of babies. The floating devices are tailored according to the size of the babies so they can be comfortable. Parents should not be worried about the water because it is purified and comfy at 95 to 98° F plus it is washed daily. What are the benefits of baby spa? After the floating, babies are taken out of the pool and they get a neonatal massage. Parents consider this because there are reports that the service increases cognitive and physical development of babies. Though it is not yet available here in Singapore, as parents, we can only hope that will come here sooner. The baby spa will surely benefit our kids.